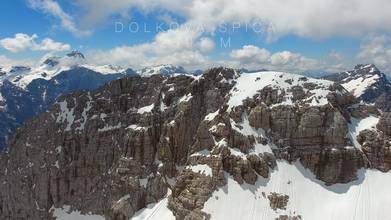 Description: Aerials from Triglav National Park, with Mt. Triglav 2864m (the highest Slovenian mountain) in the background and from the top of Dolkova Spica at 2591m. We hiked from Vrata valley on the western route to the top of Dolkova Špica. It took us 6 hours to the top with some snow still on the slopes and then 2 hours back to the car 1600m vertical drop. It was an awesome day to be in the mountains. Huge thanks to my friend Matic, who helped to carry all the equipment on the mountain!